Pawsitive Impressions: The Monroe, Michigan Team Uses NEIGHBORLY, KNOWLEDGEABLE Service to Prove that PSP is the RIGHT Place to Shop! The Monroe, Michigan Team Uses NEIGHBORLY, KNOWLEDGEABLE Service to Prove that PSP is the RIGHT Place to Shop! As a recent and first-time customer at your store on Telegraph Road in Monroe, Michigan, I wanted to let you know about my experience. I came in over the Memorial Day Weekend intending to go to the store with the 20% off sale I had seen on-line. The employees were very helpful in locating what I wanted and advising me. However, the price was not was I expected. 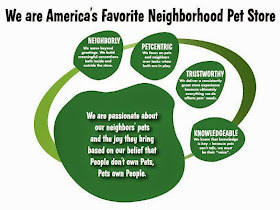 The manager signed me up as a Preferred Pet Club member, talked over my purchases and prices with me, and even went so far as to look up the other store on the internet for me. Obviously, I had come to the wrong store; but I was glad I did, as it turned out. She not only matched their price, but I received my Pet Club discount and, most important, excellent and personal customer service. I just wanted to let you know how happy I was with the experience, and especially the manager who went to great lengths to assist me. I will definitely be making a return visit! Thank you for your employees!